Click this link to apply the current Vitamix promo code for free shipping from Vitamix.com to the US, UK, or Canada in April 2019. (It works on any order size!) The code also takes $20 off Ascent Smart System models. If you are looking for a general Vitamix coupon code, this is the best deal you’ll find, since Vitamix does not offer other general coupon codes.1 Right now they are running a big Mother’s Day Sale, with discounts on most models. Confused by the differences between Vitamix models? Check out my Vitamix comparison page. Another ongoing deal to consider is interest-free money in the form of a Vitamix payment plan, which you can combine with the promotion code. You can get a Vitamix for as low as ~$18 per month, with no added fees. If you use one of these links to make a purchase, in addition to you receiving free shipping, Joy of Blending may get a commission (at no added cost to you). It helps support ongoing recipe development and blender testing. Thanks for your support! To use this Vitamix promotion code, just click any link to Vitamix.com from this site. Then add something to your shopping cart, and you should see a “Free Shipping” line that subtracts the shipping cost. 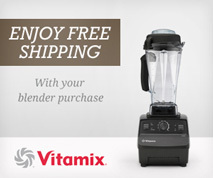 Finally, speaking of free shipping, remember that Vitamix offers a 30-day risk-free trial. If your Vitamix machine isn’t everything that you had hoped for, you can call up Vitamix, and they will pay for return shipping by sending you a shipping label. This is relatively impressive, considering that the shipping weight is 16–19 lbs! Once Vitamix receives the machine, they will give you a full refund as long as you are still within the trial period. Thanks, you just saved us $48 CDN on our blender!!! Ordered on Oct. 1/2017. It works! We saved $32.49. 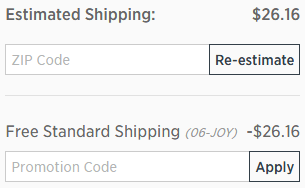 Saved $5 (that’s big, like many people I hate paying any money for shipping)! Thanks… Just saved 51$. Can’t wait to receive my first Vitamix blender! I just checked, and it is still active. Try opening a new incognito or private browser window, click one of the links above, and then add something to your cart. You should see the cost of shipping subtracted off in a line under the “Estimated Shipping” line.